Well this is one of the hidden malls most of Delhi residents would never prefer to visit considering its location at the outskirts of Delhi i.e. Anand Vihar. But pacific mall is worth a facility to roam around and among the best food courts than any other malls of Delhi. You can go to the best located malls of Delhi as in Raja Garden etc. but the food court will be disappointing in most of the malls but Pacific Mall food court is an exception. I say it with full responsibility that it is comparatively among top 3 as compared to any other malls of Delhi-NCR be it Shipra Mall. I mean it when I am making this statement. This Mall may not be counted in Delhi List due to its poor location but it is one of the best taste, variety food courts you will find in Malls. If it comes to eating at a food court in a mall, I will definitely say let’s go PACIFIC MALL. I have been eating here on and off for last 5 years now and so far I am satisfied with the taste and quality of brands. I never mind taking my family for a lunch here which I hardly do at any other malls of Delhi. One more reason is that most of food joints at this food court are stable since last many years as Fastrax, Pizza hut, Bikano besides some other good taste restaurants as Lucknow Food, China Town, Amritsari, Dosa Plaza etc. The mall is cozy to roam even on Sunday and you won’t see it over-crowded (unless there is some event) as you see in GIP Noida or Shipra Mall etc. The best time to visit here is on Sunday as you will see lots of good crowd and activity. Well this is not a real car, this is something I found when I drove down to west Delhi and discovered a new taste of various Kathi Rolls at a new food chain. This is a brand stating itself as ‘Taste Drive’ and available in many of the adjacent malls near Rajouri Garden Metro Station also known as Raja Garden Metro Station. I went there 4-5 times and tried it every-time and thus got motivated to write and share something about it to you. Although this is not a very extraordinary taste If I compare it to rolls by Karim’s restaurant i.e. Karim’s Roll, Nazeer’s Taka Tak, Khan Chacha’s Roll, Nizam’s Kathi Kabab or even Lacha Parantha Roll that I have in Ghaziabad and even Amritsari Rolls that I often try in Indirapuram, yet it is now one of my most favorite taste at Raja Garden. I also want to mention one other Kathi Roll that I always try whenever I go to ‘Ramkrishna Mission’ Delhi, which is much more delicious than this. The uniqueness of Taste Drive food joint among all is due to its overall ambiance, presentation and position of creative car-shaped-Kitchen shop, which enhances the overall experience of tasting this role surrounded by colorful people and ambiance. They also have varieties of Rolls with different tastes both in veg and non-veg, which is their USP, and that too at an economical price of less than Rs. 100. They will offer you this role in a proper thick branding cup-shaped cover so as you can eat it comfortably. One other value to experience at Taste Drive is that you will get the same happy, celebrating feeling as you often see in McDonalds, with many young kids, families buying and eating along. The best experience is to taste it at eve and you will be accompanied by lots of good crowd. You will find people sitting on pavement, floor or walking casually and enjoying this food. And I find it a very lively and healthier experience as it creates a state of mind, a psychology that helps to enhance your experience at this food-joint. Lastly they are all located inside the malls at a good pollution free location, less dust prone and thus more hygienic. If you ever feel to go there and try it, you can find this Taste Drive Car-shaped food joint at TDI Mall, Westend Mall and City Square Mall near metro station. As I am foodie, I got a specialty food joint in Delhi where-in you can enjoy a unique dish known as Tunday Kababi. So far I am very happy with its taste at this food joint, which is Windsor Street Market in Indirapuram, Ghaziabad. It is just few meters ahead of road of Aditya Mega Mall facing Rajhans Plaza Complex. This dish is said to be part of Awadhi cuisine (techniques of Mughalai food) and said to incorporate 160 spices Ingredients and the basic ones are melted ghee, onions, sugar, onion, crushed garlic, cardamom, clovers, yogurt, vinegar, lime, meat and various other masalas etc. It is a unique dish and flavour made out of minced meat, which basically got popular in Lucknow city of Uttar Pradesh as there is a 100 years old restaurant of Tunday Kabab in Chowk. If you ever get chance to eat this, you can try it and you will enjoy a new fragrance and flavor in it. 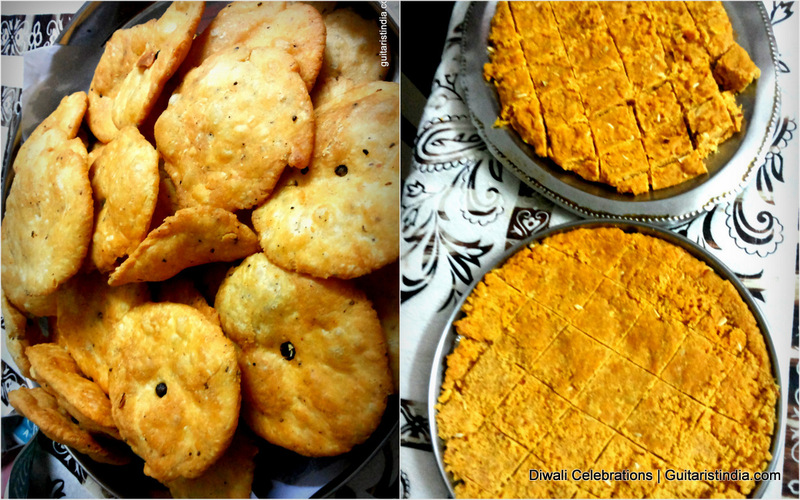 Every year my father loves to be in Kitchen and make his two most delicious recipes as Mathi, and Besan ki Barfi during Diwali. One is a namkeen while other is a sweet. This Diwali he also takes out his time and solely prepares both of them. I love them both, primarily the first one and wish to learn this talent and apply it. Here is a mobile shot of both food by my father.